While I might have complained when I first heard that Theresa May was taking the country to the polls, it wasn’t long before I found myself getting stuck in campaigning in my local community, and implementing our (hastily assembled) election plans at work. Who knows what will happen on Thursday evening, but before the results come I wanted to highlight a few ‘winners’ from the election, based on the campaigns that I’ve noticed. 1. The rise of the MicroPACs – BBC News has this great article on the rise of individuals who’ve used Facebook and other social media platforms to get their campaign messages out, what they’re dubbing MicroPACs – after the Political Action Committees that pour huge amounts of money into campaigns in the US. While much of the campaign news has focused on the huge ad spends of the Conservative Party on Facebook advertising, learning from what Trump did in the US which is summarised well here.It’s fascinating to see how individuals with some expertise of how to do effective targeting, and effective messages can get them out in front of tens of thousands of people. Certainly a lesson to be learnt here for all campaigning organisations about how giving away some control of your message can lead to creative execution of ideas. Having said that the work that the team behind Who Targets Me has been doing is also fascinating work tracking the adverts that the parties are pushing – this article gives a small snapshot in the breadth of messaging targeting. 2. 38 Degrees and Avaaz dive right in – Unlike 2015 when it felt that both of the big online platforms seemed to be less involved, both Avaaz and 38 Degrees have been really active in this election. Perhaps been learning from colleagues at Get Up in Australia who’ve built themselves in formidable election campaigning machine. 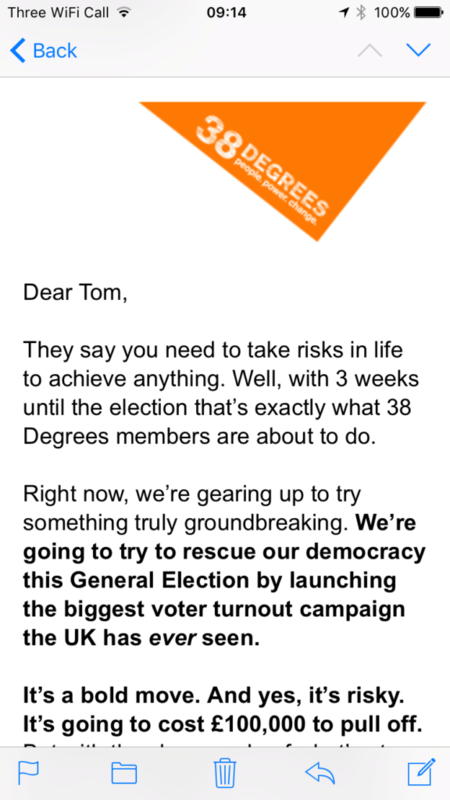 While 38 Degrees have been focusing on voter turnout in two marginal seats (Hove and Bath) looking to encourage civic participation rather than pushing a specific party, as well as organising a hustings. 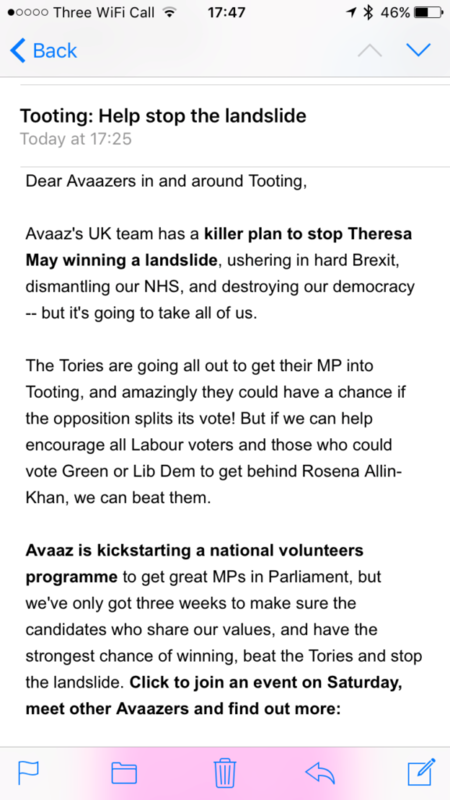 Avaaz have been much more active at pushing supporters to join activities of progressive parties, and supporting the work of the Progressive Alliance (see below). It’s also been interesting to see a few other initiatives emerge during the election, including More United, which was is campaigning for pro-Remain candidates, and Campaign Together, which has been driven by some campaigners involved in the Bernie Sanders campaign. I’m sure post-election there will be time for those involved in some of these initiatives to share the stories of what worked and didn’t work, hopefully providing some useful lessons for campaigners on new models of organising. 3. Go local – I’ve long been impressed by the School Cuts campaign run by the NUT but they seemed to have kicked it up another level this election. The website has been updated to show the impact of proposed party manifestos from each party, coordinate local groups – I’ve seen an increasingly active local campaign in Tooting where I live, and some cracking social content which has clearly tapped into parents concerns. Some really useful lessons in this for all campaigners, including about the importance of providing local information if you can to help make your campaign as tangible as possible to people. 4. The Lobbying Act – despite renewed assurances from NCVO and even the Electoral Commission that charities can campaign, the act seems to have had the anticipated ‘chilling effect’ on many charities (see here as a good example of concerns). Perhaps it was the short notice of the campaign that meant unlike 2015 organisations didn’t have time to prepare, but the act has once again appeared to have an impact on the way that many charities have engaged in the election. Following the election, campaigners need to look again at how we can get the Act amended to remove any ambiguity about charities campaigning during elections. 5. Aid Campaigners – so I’m biased, and can’t share everything that happened, but the first few days of the election saw a huge amount of focus on if the Prime Minister would commit to maintaining the 0.7% aid target. It was a heavy lift, but within a few days we’d seen all parties commit to the target. It happened through a combination of bringing smart insider engagement with key influences together with targeted public pressure demonstrating the depth of support for the issue, and developing messaging we felt would resonate beyond our traditional supporters (see #BiggerBritain). It was lesson for me of the importance of how all the aspects of advocacy can complement each other, and how to use different tactics to drive the issue across news cycles. I’ll write more in due course! And finally, NCVO has also come up with a neat list of 10 great charity campaigns this election – it’s full of more good ideas of how charities can make the most of an election.